Yellow-legged Gull is a species that did not exist until part-way through this Atlas survey! Large gulls are obviously in a state of genetic flux and can generate considerable discussion amongst some birdwatchers and much research amongst taxonomists, molecular biologists and behavioural ecologists. 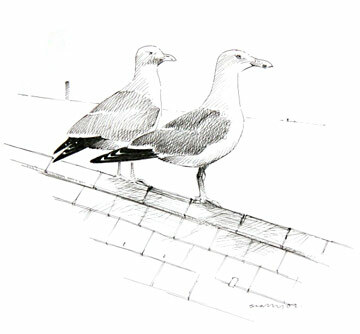 The British Ornithologists’ Union, the arbiters of the British List, had taken a conservative approach but in October 2005 announced that Yellow-legged Gull would be considered as a separate species. They breed, mainly at coastal sites and usually on rocky cliffs, around the Mediterranean Sea, where the population is increasing rapidly (Hagemeijer & Blair 1997). Some have spread north along the Atlantic coast of France, and they have bred in Britain, from 1995 onwards. There has been little growth in numbers breeding in Britain, however; by 2004 there was only one pure pair, in Dorset, and mixed pairs with Lesser Black-backed Gulls in Bedfordshire and possibly Northern Ireland. Only hybrid young have been raised since 2001 (Holling et al 2007). Many Yellow-legged Gulls stay close to their breeding sites all year round, but others, especially immature birds, wander and some reach Britain. Here they mix with the other large gulls and share their habits and feeding areas, especially landfill sites and adjacent areas for loafing. During this winter Atlas most records came from the vicinity of Arpley Tip, at Fiddler’s Ferry (SJ58M), the River Mersey at Richmond Bank (SJ58T) or Moore Nature Reserve (SJ58X), with other sightings from the Mersey off Pickering’s Pasture (SJ48W) and Sandbach Flashes (SJ75J). Up to three birds were seen at a time. Boyd recorded the first known ‘Yellow-legged Herring Gull’ in Cheshire on 3 January 1942 at Witton Flashes (Boyd 1951), but it was thirty years before another was documented, at Neston on 1 September 1972, followed by another at New Brighton on 15 November 1977 (CWBRs). Despite uncertainty over their status, the annual county bird reports have included records every year since 1980. The history of these records has inevitably reflected the growing awareness and interest of recorders and knowledge of criteria for identification and ageing. Through the 1980s and 1990s there was a gradual rise of records. Birds were found in every month, with most in the period July to October, but monthly maxima during the winter period of 6 in December, 11 in January and 5 in February. Nearly all sightings were inland in Cheshire, especially at sites along the River Mersey (Fiddler’s Ferry, Richmond Bank/Gatewarth, Arpley Tip), Neumann’s Flash while the nearby tip was still active, and Sandbach Flashes and the nearby Maw Green Tip, with a few records from the gull haunts at Arclid SQ, Chelford SQs and Witton Flashes. Yellow-legged Gulls were seldom recorded at Wirral sites, but from 2001 onwards there have been more birds reported at Hilbre and the coast from West Kirby to Leasowe. There has also been a wider spread of other sites in the county than in previous decades, with winter records from Hurleston Reservoir, the area of Danes Moss Tip and Sutton Reservoir, and Wimbolds Trafford near the Gowy Landfill site. Compared to most recent years, this Atlas map seems to be rather empty: ironically, there have been fewer records since Yellow-legged Gull was declared to be a separate species than previously.